Most dairy producers chose a phase feeding program for their cows consisting of two generally accepted dry periods (period between the end of a lactation and calving) phases (Table 1). Studies show that cows with dry periods longer than 60 days or shorter than 45 days are not maximizing their milk production potential (Rodenburg, 2003). Producers must decide when to start the dry-off period based not only on how many days the cows are in milk or how close they are to calving but must consider how much they are still producing. It is not recommended to dry-off cows producing more than 11.7L per milking; it has been found that for every 5-kg increase in milk yield at dry-off above 11.7L, the odds of a cow having an environmental intramammary infection at calving is increased by at least by 77% (Rajala-Schultz et al., 2005). This can lead producers into choosing short dry-periods randomly for individual cows; resulting in more time spent managing dry cows. Another aspect to be considered is the cows body condition score (BCS), which should be 3.5 at parturition (See Photo 1). The problem is that a cow with a BCS that is either to low or high at calving will increase the risk of disease: cows in the low group are prone to reproductive compromise and cows in the high group have an increased risk of metabolic diseases (Roche et al., 2013). The struggle is finding a balance in their diet. Traditionally, dry cows will have a diet consisting primarily of hay or forages (low energy) in phase 4. Concentrates are typically reintroduced during Phase 5 (higher energy diet) (Rodenburg, 2003). Changing a cow’s diet from silage and concentrates to hay-based should be done gradually because the change in diet alters the very structure of the rumen and its microbial populations (Grasty, 2016). When cows are switched to a hay-based, low energy diet and back within a transition period (the three weeks preceding and following calving) of 45 days or less there is an increased risk for metabolic problems due to the decreased efficacy of ruminal digestion (Amanlou et al., 2008). If producers opt for a shorter (35 to 45 day) dry period for their cows, they may find it is easier to maintain healthy ruminal function and body condition for their cows through the transition period. This is done by moving directly into a close-up dry diet (Phase 5) and continuing milk production until that point. It is important to keep in mind that a dry period of at least three weeks is necessary for the udder to prepare for the next lactation (Rodenburg, 2003). Because recent studies show that a dry period of 30 to 35 days has no detrimental effect on or could increase production per lactation, the previously established dry period of 45 to 60 days is being called into question. A study by M.S. Gulay, M.J. Hayen, K.C. Bachman, T. Belloso, M. Liboni, and H.H. Head (2003) at the University of Florida involved 84 random but healthy cows that were intentionally given a shorter dry period. They found that there was no difference in production except for the extra production days at the end of their lactation which amounted to an extra 510 kg of milk per cow. In their following lactation, the researchers found, cows with 30-day dry periods had a higher feed intake in the first month of lactation and maintained better body condition scores than cows dry for 60 days. In another 2003 study in Wisconsin, R.R. Grummer and R. Rasini (2003) had similar findings but additionally, their preliminary results suggested that a shorter dry-period resulted in cows cycling and conceiving earlier. In summary, the known benefits of a 35 to 40-day dry period and a single dry cow group includes; maintain a healthy body weight in cows going through transition, increased milk production, higher feed intake in fresh cows and fewer feeding phases to manage (Rodenburg, 2003). Amanlou, H., D. Zahmatkesh, and A. Nikkhah. 2008. Wheat grain as a prepartal cereal choice to ease metabolic transition from gestation into lactation in Holstein cows. Journal of Animal Physiology and Animal Nutrition. 92 (5): 605-613. Grummer, R.R., and R. Rasani. 2003. Dry cow management: can we shorten the dry period? In Proceedings of the Dairy Health Management Certificate Program, 2003 Annual Update Meeting. Ontario Veterinary College. University of Guelph. Linn, J.G., M. F. Hutjens, R. Shaver, D.E. Otterby, W.T. Howard, and L.H. Kilmer. 2005. Feeding the dairy herd. University of Minnesota Extension. Rajala-Schultz, P.J., J.S. Hogan, and K.L. Smith. 2005. Short communication: association between milk yield at dry-off and probability of intramammary infections at calving. Journal of Dairy Science. 88 (2): 577-579. Queensland Government: Department of Agriculture and Fisheries. 2013. 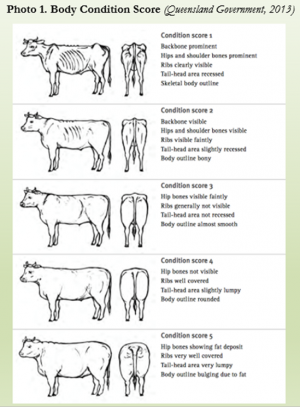 Animal health and disease investigation: Animal body condition scoring. Available at: https://www.daf.qld.gov.au/__data/assets/pdf_file/0015/53520/Animal-HD-Investigation-Condition-scores.pdf (accessed 6 Feb. 2018). The State of Queensland, AU. Rodenburg, J. 2003. New research suggests shorter dry periods puts more milk in the tank. Ontario Milk Producer. Ontario Ministry of Agriculture, Food and Rural Affairs. Published by Olivia Belisle on February 12, 2018 at 8:15 pm under Uncategorized. Thank you Olivia for your article! It was very interesting and, indeed, an important topic in the dairy industry where the milk price tend to decrease while the expenses are still high. You highlighted very well the major benefits of such a practice, being higher milk yield, overall benefits for the cow’s health, higher quality/easier transition period for the cow, and more efficient feeding management. A very strong aspect of your article is the quality of the explanations, which makes it easy to follow and understand even for people that don’t know much about dairy production. I really liked the fact that you supported your text with many high quality references, which is, in my opinion, crucial for a science-based text to be credible. When you explained that the short dry period could facilitate feed management on top of the other benefits for the cow, for me it was the argument that is the most compellent, especially to the producers who need to find new ways to improve the overall efficiency on the farm in order to continue to make significant profits by those days. A small adjustment that I would propose woud be when you talk about BCS. Around calving, the new tendency if to target 3.0 to 3.25 since holstein cows, nowadays, tend to naturally be around those scores. Pushing them around 3.5 would be forcing them to be overweight (Santschi, 2018). Except that, I think you explained very well what is short dry period, you could have incorporated your opinion a bit on the topic, but I know it was hard to put all the information we would have liked to with the limit of words though! Thanks again for this interesting ”dairy” topic!